Hanoi is the capital and the Vietnam’s second largest city with nearly 7 million in population. Ha Noi lies at the center of the triangular basin of the Red River. As the capital of Vietnam for almost a thousand years, Hanoi is considered to be the cultural center of Vietnam, where many dynasties has left behind their imprint. Hanoi hosts more cultural sites than any city in Vietnam, including over 600 temples, ancient citadels and unique theatres. 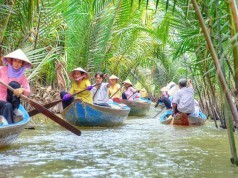 Hanoi is famous for numerous rivers, lakes, and mountains alongside and in the surroundings. Scattered around are places of sightseeing, which are so much attractive thanks to green lands full of streams, rivers, and mountain, such as Tam Dao, Con Son, Kiep Bac, etc. Hanoi is also well known for typical tropical seasoned place of South East Asia with four seasons: fresh, green and cool in Spring, a bit hot in Summer, fine in Autumn, and cold in Winter. As you may have found out, Hanoi is more an antique and peaceful city than a modern one. This might be seen quite clearly when you take a walk around the 36 Old Quarter. This is a typical characteristic of Hanoi with small old streets, tube houses which still remain their shape from 19th century. 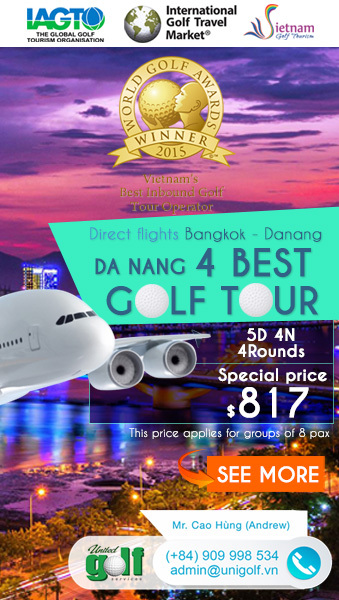 UniGolf 3 days – 2 nights golf tour will bring you to 3 top golf courses in Ha Noi: Ha Noi Golf Club, Kings’ Island Golf Club, Tam Dao Golf Resort. Located at foot of the mountain region in Soc Son district where is about 40 minutes by car from the center of Ha Noi. 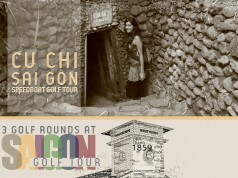 With 108 hectare size, the course is generally recognized as the first and only Japanese-managed golf course in Vietnam. The course has its reputation as being a high quality course and perfect service and facilities . The 18-hole course features 6,883 yards of golf from the longest tees for a par of 72. Since the grand opening ceremony in 2006 with 18 holes golf, the club made a major improvement with the construction of nine more holes in 2013. Beautiful dark green, fine texture Tifgreen 328 Bermuda grass have received daily care by high technology and advanced techniques under the guidance of experienced grass expert – Mr Hiromu Nakaoka. Situated on a small island in the middle of Dong Mo Lake where is at the foot of Ba Vi Mountain (known as “the King of mountains” in the Vietnamese spirit). It takes you approximately 30 minutes by car from the center of Ha Noi and 3 more minutes across the Dong Mo Lake by speedboat. The 36-hole course situated on 350 hectares of hilly area and is divided into two great 18-hole courses: Lakeside and Mountain View. As the name Lakeside do suggest, 14 out of 18 holes bringing water in play that will fill your lung with fresh air and feast your eyes on the charming lake here. Meanwhile, Mountain View makes a great and unforgettable impression for golfers by its breathtaking view of the surrounding mountains. 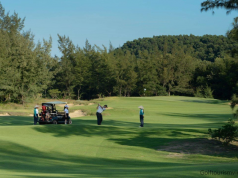 Situated in the beautiful Tam Dao Mountain in Vinh Phuc province at an elevation of 1,000m above sea level and known as the most scenic golf course in the North of Vietnam. It takes 60 minutes by car from the center of Ha Noi (65km). The 18-hole course features small quiet streams, lakes and waterfalls. Strategically placed bunkers and water hazards provides an enjoyable challenging for golfers of all levels. The course also have an international standard clubhouse with total 10.000 m2, 10 luxury rooms capable of serving large group of golfer. A team of more than 200 caddies always as your service. During 2 nights at Ha Noi, you will stay at 4-star Golden Silk Boutique. The hotel is located in the center of Ha Noi with only few steps to Thang Long Water Puppet Theater and Hoan Kiem Lake. Imperial Literature and Ho Chi Minh Mausoleum are also very near here. 55 all-equipped rooms with air-conditioner, amenities like Spa, Steam Bath, Gift Shop or Information Counter. Day 3: After breakfast, play 1 round of golf at Tam Dao Golf Resort, then transfer by car to the airport. 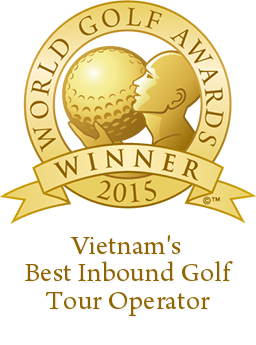 Keyword: Ha Noi Golf Club, Kings’ Island Golf Club, Tam Dao Golf Resort.